Not to be confused with 2018 United States Senate election in Mississippi. The 2018 United States Senate special election in Mississippi took place on November 6, 2018, to elect a United States Senator from Mississippi. The election was held to fill the seat vacated by Senator Thad Cochran when he resigned from the Senate, effective April 1, 2018, due to health concerns. Republican governor Phil Bryant appointed Cindy Hyde-Smith to fill the vacancy created by Cochran's resignation. Hyde-Smith sought election to serve the balance of Cochran's term, which expires in January 2021. On November 6, per Mississippi law, a nonpartisan top-two special general election took place on the same day as the regularly scheduled U.S. Senate election for the seat currently held by Roger Wicker. Party affiliations were not printed on the ballot. Because no candidate gained a simple majority of the vote, a runoff between the top two candidates, Cindy Hyde-Smith and Mike Espy, was held on November 27, 2018, in which Hyde-Smith defeated Espy. Despite her reasonable margin of victory, Hyde-Smith significantly under-performed the states's partisan lean, as well as the 20-point margin of victory of Roger Wicker in his senatorial election, held concurrently with the first round of the special election in which the combined GOP candidates won 58% to the combined Dem total of 42%. Espy's 46.4% of the vote is the best Democratic performance in a Mississippi senate election since the 1982 election. The victory made Hyde-Smith the first woman ever elected to the Senate from Mississippi. Note: Special elections in Mississippi are nonpartisan. The parties below identify which party label each candidate would have run under if given the option. Tobey Bartee (Democratic Party), former Gautier, Mississippi city councilman. Jim Hood, Mississippi Attorney General and Candidate for Governor in 2019. During the run-off campaign, while appearing with cattle rancher Colin Hutchinson in Tupelo, Mississippi, Hyde-Smith said, "If he invited me to a public hanging, I'd be in the front row." Hyde-Smith's comment immediately drew harsh criticism, given Mississippi's notorious history of lynchings of African-Americans. In response to the criticism, Hyde-Smith downplayed her comment as "an exaggerated expression of regard" and characterized the backlash as "ridiculous." Hyde-Smith joined Mississippi Governor Phil Bryant at a news conference in Jackson, Mississippi on November 12, 2018, where she was asked repeatedly about her comment by reporters. In the footage, Hyde-Smith adamantly refused to provide any substantive answer to reporters' questions, responding on five occasions with variations of, "I put out a statement yesterday, and that's all I'm gonna say about it." When reporters redirected questions to Bryant, he defended Hyde-Smith's comment, and changed the subject to abortion, saying he was "confused about where the outrage is at about 20 million African American children that have been aborted." On November 15, 2018, Hyde-Smith appeared in a video clip saying that it would be "a great idea" to make it more difficult for liberals to vote. Her campaign stated that Hyde-Smith was making an obvious joke, and the video was selectively edited. Both this and the "public hanging" video were released by Lamar White Jr., a Louisiana blogger and journalist. Hyde-Smith defeated Espy in the runoff election on November 27, 2018. She received 54% of the vote compared to Espy's 46%. ^ Jacobs, Ben (March 5, 2018). "Mississippi Senator Thad Cochran announces he is stepping down". the Guardian. Retrieved March 5, 2018. ^ CNN, Eric Bradner, Kaitlan Collins and Ashley Killough. "Governor picks Cindy Hyde-Smith to replace Cochran". ^ "U.S. Chamber poll shows Cindy Hyde-Smith leading Mike Espy, Chris McDaniel in Senate race". Retrieved November 19, 2018. ^ Rakich, Nathaniel (March 6, 2018). "How Things Could Go Wrong For Republicans In Mississippi's New Senate Race". FiveThirtyEight. Retrieved April 28, 2018. ^ "The Latest: Mississippi has 3 more weeks of US Senate race". AP NEWS. November 7, 2018. Retrieved November 8, 2018. 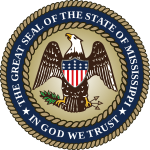 ^ "2018 Elections Calendar – Mississippi Secretary of State" (PDF). Retrieved October 30, 2018. ^ "Shelton leaves special US Senate race". wtok.com. Retrieved August 26, 2018. ^ Carroll, Liz (April 23, 2018). "Chris McDaniel, Tobey Bartee qualify to run for U.S. Senate seat". wjtv.com. Retrieved August 26, 2018. ^ Pender, Geoff (March 5, 2018). "Espy announces run for Cochran Senate seat". The Clarion-Ledger. Retrieved March 6, 2018. ^ "Who will get the Golden Ticket for US Senate from Phil Bryant? – Yall Politics". yallpolitics.com. ^ "McDaniel to Run for Open Mississippi Senate Seat – Chris McDaniel for US Senate". March 14, 2018. ^ "Senator Chris McDaniel". www.facebook.com. ^ "Here are a few Democrats who could make a U.S. Senate run in Mississippi". The Clarion Ledger. Retrieved December 29, 2017. ^ "Millennial Democrat enters 4th Congressional District race". sunherald. Retrieved December 29, 2017. ^ "Cochran resigns effective April 1". POLITICO. Retrieved March 8, 2018. ^ "Bryant not interested in Cochran seat despite urging from Trump, McConnell". ^ Bedillion, Caleb (March 29, 2018). "Lee County Democratic Party leader mulls Senate run". Northeast Mississippi Daily Journal. Retrieved March 29, 2018. ^ @Andy_Taggart (March 18, 2018). "I have a lot of confidence in @PhilBryantMS to make a wise choice on current @SenThadCochran vacancy. But I also intend to hold open whatever options are needed to fend off @senatormcdaniel, including a run against him" (Tweet) – via Twitter. ^ JOURNAL, CALEB BEDILLION DAILY. "Shelton stokes questions about possible Senate run". ^ "Tupelo Mayor Jason Shelton announces run for U.S. Senate special election in Mississippi". clarionledger.com. Retrieved August 26, 2018. ^ "Democratic Mayor Jason Shelton drops out of Senate race". clarionledger.com. Retrieved August 26, 2018. ^ Donald J. Trump. ". @cindyhydesmith has helped me put America First! She's strong on the Wall, is helping me create Jobs, loves our Vets and fights for our conservative judges..." Twitter. ^ Donald J. Trump. "...Cindy has voted for our Agenda in the Senate 100% of the time and has my complete and total Endorsement. We need Cindy to win in Mississippi!". Twitter. ^ Lindsey Graham. "Look forward to campaigning today with President @realDonaldTrump, @VP Pence, and Sen @cindyhydesmith who was as solid as a rock in supporting Judge Kavanaugh. She's strong on the border, the military, and supports conservative judges and limited government". Twitter. ^ "Haley Barbour weighs in on special election". MSNBC. September 14, 2018. ^ "Cindy Hyde-Smith, United States Congress". cindyhydesmith.com. ^ Kamisar, Ben (April 13, 2018). "Chamber of Commerce makes play in Mississippi Senate race for Hyde-Smith". The Hill. ^ "REALTORS® Political Action Committee (RPAC) Endorses Hyde-Smith for U.S. Senate". Yall Politics. April 25, 2018. Retrieved April 25, 2018. ^ Cindy Hyde-Smith. "Honored to have the endorsement of @MSManufacturers! Both America and our state need strong business environments, and I am working with President @realDonaldTrump to end regulations that harm economic growth! #cindy2018". Twitter. ^ "NRA Endorses Hyde-Smith for U.S. Senate". National Rifle Association. August 13, 2018. ^ Carter, Courtney (September 10, 2018). "National Right to Life endorses Hyde-Smith for Senate". Yall Politics. ^ "SBA List Candidate Fund Endorses U.S. Senator Cindy Hyde-Smith in MS". Susan B. Anthony List. October 25, 2018. ^ McLaughlin, Seth. "Ron Paul endorses Chris McDaniel in Mississippi Senate race". Washington Times. Retrieved September 22, 2018. ^ "State Representative Dana Criswell Endorses Chris McDaniel for United States Senate". mcdaniel2018.com. October 10, 2018. ^ "State Representative Steve Hopkins Endorses Chris McDaniel for United States Senate". mcdaniel2018.com. October 4, 2018. ^ "Former State Senator Tony Smith Endorses Chris McDaniel for United States Senate". mcdaniel2018.com. October 1, 2018. ^ "#RememberMississippi PAC releases 'grassroots' letter to Chris McDaniel regarding #mssen". yallpolitics.com. Y'all Politics. December 19, 2017. Retrieved January 4, 2018. If Senator Chris McDaniel chooses to run for U.S. Senate, he will have our support and the support of these state and local leaders, along with many of their grassroots organizations... We are ready to hit the ground running to elect Chris McDaniel. ^ "#RememberMississippi PAC releases 'grassroots' letter to Chris McDaniel regarding #mssen". yallpolitics.com. Y'all Politics. December 19, 2017. Retrieved January 4, 2018. In 2014, the common folks of Mississippi made the very definite statement that we are not being heard and those in power have no intention of hearing us... One person, Chris McDaniel, had the courage to say enough is enough. We almost got it done and common people all over the country recognized what we nearly accomplished. We support Chris McDaniel’s efforts to reestablish governance by the consent of the governed. ^ "#RememberMississippi PAC releases 'grassroots' letter to Chris McDaniel regarding #mssen". yallpolitics.com. Y'all Politics. December 19, 2017. Retrieved January 4, 2018. Year after year, our Senators and Congressmen rank so low on most conservative scorecards. It’s time we elect a Senator who truly represents Mississippi’s conservative constituency. ^ "Former President of the National Sheriffs' Association Endorses Chris McDaniel for United States Senate". mcdaniel2018.com. September 27, 2018. ^ Fischer, Bryan [@BryanJFischer] (March 14, 2018). "Chris McDaniel decides to run for open Senate seat in MS. Excellent move. First one out of the gate. Puts the establishment on its heels playing catch-up. If the GOP is smart, will rally to his banner. Are they that smart?" (Tweet) – via Twitter. ^ "American Family Radio's Bryan Fischer Endorses Chris McDaniel for United States Senate". mcdaniel2018.com. June 10, 2018. Retrieved August 26, 2018. ^ "Nationally-syndicated radio host Lars Larson endorses Chris McDaniel for United States Senate". mcdaniel2018.com. October 18, 2018. ^ "Sen. Chris McDaniel on Twitter". Twitter. Retrieved July 3, 2018. ^ ""I strongly endorse Chris McDaniel. I think he'd be a solid conservative for Mississippi. Senators vote on issues that affect ALL of us. I can't imagine the people in Mississippi electing someone who was a Hillary Clinton supporter for all those years." – @marklevinshow". Twitter. Retrieved October 27, 2018. ^ "Kelli Ward Is Trying to Consolidate the Kook Vote". The Weekly Standard. August 22, 2018. ^ a b c d "Adams County GOP Executive Committee Endorses Chris McDaniel for United States Senate". mcdaniel2018.com. October 17, 2018. ^ "Gun Owners of America Endorses Chris McDaniel for United States Senate". mcdaniel2018.com. September 20, 2018. ^ "Americans for Legal Immigration Endorses Chris McDaniel for United States Senate". mcdaniel2018.com. October 12, 2018. ^ Axelrod, Tal (November 27, 2018). "Obama records robocall for Espy in Mississippi Senate runoff". TheHill. ^ "Former VP Joe Biden endorses Mike Espy in U.S. Senate race". wapt.com. Retrieved November 20, 2018. ^ "U.S. Senate Candidate Mike Espy Receives Backing of New Jersey Sen. Cory". yallpolitics.com. Retrieved August 26, 2018. ^ "CALIFORNIA SENATOR CAMPAIGNS FOR ESPY". wtva.com. Retrieved November 19, 2018. ^ Brian Schatz. "I'm giving to @espyforsenate please feel free to join me and send help too. Thank you". Twitter. ^ Elizabeth Warren. "Mississippi – there's still time to vote for Mike @EspyforSenate today! Polls close in two hours, and as long as you're in line by 7pm you can still cast your vote". Twitter. ^ "Ayanna Pressley travels to Mississippi to campaign for Democrat Mike Espy". ^ "Bennie Thompson urges national Democrats to back Espy Senate bid". ^ Terri Sewell. "Stompin for @espyforsenate in Mississippi on Friday! Catch the Blue Wave!!! #BlueWaveComing2018". Twitter. ^ "Deval Patrick to Join Mike Espy in Hattiesburg Saturday". ^ Shante Sumpter (October 6, 2018). "Los Angeles Mayor Endorses Mike Espy for U.S. Senate". WTVA. Archived from the original on October 7, 2018. Retrieved November 18, 2018. ^ "CALIFORNIA SENATOR CAMPAIGNS FOR ESPY". politico.com. Retrieved November 20, 2018. ^ Wesley K. Clark (September 19, 2018). "Wesley K. Clark endorses Mike Espy for U.S. Senate seat". Clarion Ledger. Retrieved November 18, 2018. ^ Alyssa Milano. "1. Mississippi Special Election VOTE FOR: @espyforsenate". Twitter. ^ "Mike Espy – U.S. Senate, Mississippi". Democracy for America. Retrieved October 13, 2018. ^ "Campaign finance data". Retrieved October 12, 2018. ^ Jason Shelton* 4%. *Withdrawn. ^ Jason Shelton* 6%. *Withdrawn. ^ "Hyde-Smith jokes about hangings in viral tweet". The Clarion Ledger. November 11, 2018. Retrieved November 11, 2018. ^ "Hyde-Smith's 'Public Hanging' Quip Bombs in State with Most Lynchings". Jackson Free Press. November 11, 2018. Retrieved November 11, 2018. ^ Danner, Chas (November 11, 2018). "Mississippi Senator Cindy Hyde-Smith Joked About Going to a 'Public Hanging'". New York Media LLC. The Intelligencer. Retrieved November 11, 2018. ^ McCarthy, Waverly (November 11, 2018). "VIDEO: Cindy Hyde-Smith jokes about sitting in "front row" of "public hanging"". WLBT License Subsidiary, LLC. WLBT. Retrieved November 11, 2018. ^ Sullivan, Kate (November 12, 2018). "GOP Mississippi senator facing criticism over comment about 'public hanging'". Cable News Network. Turner Broadcasting System. Retrieved November 12, 2018. ^ Zwirz, Elizabeth (November 11, 2018). "Sen. Cindy Hyde-Smith's Democratic opponent Mike Espy slams 'public hanging' remark as 'reprehensible'". Fox News. Fox News Network LLC. Retrieved November 12, 2018. ^ "Senator deflects over 'public hanging' comment". Cable News Network. Turner Broadcasting System. November 12, 2018. Retrieved November 13, 2018. ^ "Mississippi GOP Sen. Cindy Hyde-Smith mum on 'public hanging' remark". NBC News. Retrieved November 14, 2018. ^ "Governor Calls Abortion 'Black Genocide,' Defends Hyde-Smith on 'Hanging' Tape". Retrieved November 14, 2018. ^ Brice-Saddler, Michael (November 16, 2018). "GOP senator: It's a 'great idea' to make it harder for 'liberal folks' to vote". Washington Post. Retrieved November 16, 2018. ^ "Sen. Cindy Hyde-Smith speaks in video about making it "more difficult" for liberals to vote". CBS News. Associated Press. November 16, 2018. ^ "2018 Senate Race ratings | The Cook Political Report". The Cook Political Report. Retrieved April 8, 2018. ^ Gonzales, Nathan L. (November 20, 2018). "Rating Change: Mississippi Senate Race No Longer Solid Republican". Roll Call. ^ "Larry J. Sabato's Crystal Ball » 2018 Senate". www.centerforpolitics.org. Retrieved April 8, 2018. ^ Silver, Nate. "Mississippi special – 2018 Senate Forecast". FiveThirtyEight. Retrieved October 20, 2018. ^ "2018 General Election Runoff". www.sos.ms.gov. ^ "Mississippi Senate Election Results: Cindy Hyde-Smith vs. Mike Espy". The New York Times. Retrieved November 28, 2018.